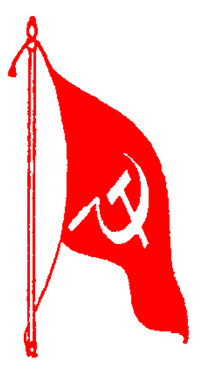 According to the list, three crucial commandos of the Naxal groups – Sainath alias Dolesh Madhi Atram (32), the alleged commander of Permelli Dalam (who, according to the police, was recently elevated as the divisional committee member) from Gattepalli, division committee (popularly known as ‘DVC’) rank-level member Naxal Srinu alias Srinath, and Nandu – were among those killed in the ambush. Besides them, six were assistant commandants, four party committee member, and rest are party members. Srinu was 45- years old and the oldest to be killed in the firing. The youngest was an 18- year old girl named Bujji Punem alias Kranti from Korsagudem in Bijapur district, Chhattisgarh.The letter claimed these 22 alleged Naxals killed were a part of Technical Counter Offensive Campaign (TCOC) from the Aheri-Perimili region and had gathered to discuss their further action plans. The letter claimed this was their worst loss in the movement’s 38 years of presence in Gadchiroli region. The district superintendent of police Abhinav Deshmukh said while the source of the list has not been confirmed yet, the list has some additional names which the police had not found before. “Some names and photographs do not match and some new names are also mentioned in the list. We are verifying them. Our investigation has stumbled upon new evidence and it is likely that that over 60 Naxals were present at the spot,” Deshmukh told The Wire. So far, the police claim to have identified 19 bodies, of which 15 have already been handed over to the respective families. Deshmukh said his officers were in the process of verifying the identity of four more. “Other bodies will have to be verified through DNA samples collected from those who come forward. It is a lengthy process,” he added. The initial reports had claimed that the police had succeeded in killing 40 “Naxals” in a deadly fire exchange. No police personnel was injured in the alleged “fire exchange”. 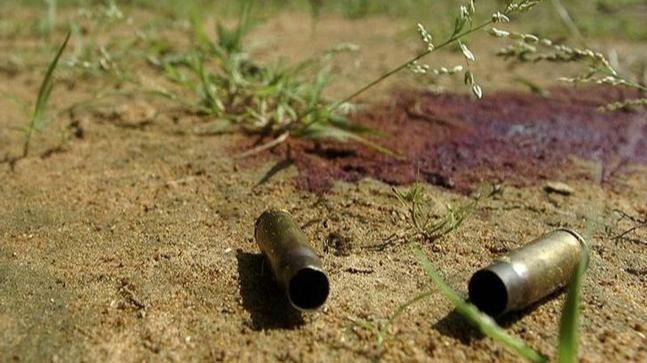 The police claimed that its over 150- C-60 commandos had entered into the forest of Kasansur village in Etapalli block in the wee hours of April 22, and when the Naxals gathered on the banks of Indravati river in the morning, unarmed, they were fired at. So far, the police have confirmed and handed over only one girl’s body to the family. Sixteen bodies were recovered from the river on the same day and another 18 on the following days. Another six, including Nandu, were killed at a nearby Kapewancha area in Rajaram Khandla forest on April 23. The police have also begun the process of disposing of the unclaimed bodies. “We have collected their DNA samples and have already disposed of 20 bodies with the sub- divisional magistrate’s permission. There aren’t any rules as to how long a body needs to be preserved. The process of disposing of the bodies have been video-graphed. All bodies have been buried in case a need to exhume them arises,” Deshmukh told The Wire. Two separate magisterial inquiries have been ordered in the two incidents of killings. According to the present order, the executive magistrates would be inquiring into the killings, as against the judicial magistrate inquiry mandated under 176 (1A) of the Code of Criminal Procedure (CrPC). There are clear National Human Rights Commissions guidelines issued on procedures to be followed in case of extra-judicial killings. In 2016, the Bombay high court had reprimanded the prisons department for not carrying out these inquiries in case of deaths in the prison. Encounter killings have by far remained away from the court’s scrutiny and mostly gone unnoticed and unquestioned. 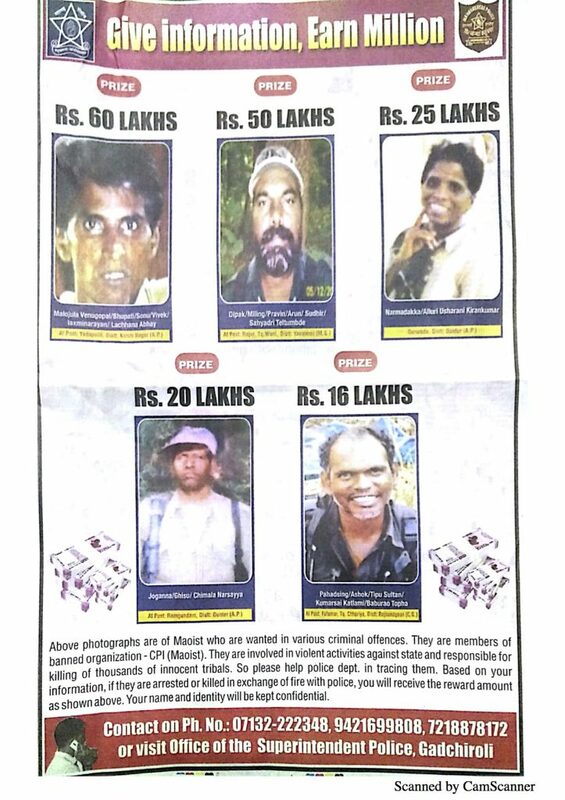 The Gadchiroli police, on May 3, had issued a full-page advertisement in a leading English daily with five names and the reward money on each person’s head. The advertisement titled, “Give information, earn million”, was issued as a part of the “routine public announcement”, Deshmukh claimed. The five persons include, Malojula Venugopal alias Bhupati of Yedapalli post, KarimNagar in Andhra Pradesh, Dipak alias Milind Teltumbde of Rajur post in Wani taluka of Yavatmal district, Narmada Akka of Guntur in Andhra Pradesh, Joganna alias Chimala Narsayya from Ramgundam post in Guntur of Andhra Pradesh and Pahadsingh alias Baburao Topha from Chhuriya taluka in Rajnandgaon district in Chhattisgarh. The cash award ranges from Rs 60 lakh to Rs 16 lakh. “We usually issue advertisements in regional newspapers. Only a few months ago, we had issued several such appeals in many Marathi papers. This was the first time we decided to put out an advertisement in an English daily to reach out to the urban masses. These wanted Naxals are in their 50s and have been visiting hospitals and other contacts in urban areas. Hence, we decided to make an announcement that could reach a wider audience,” Deshmukh claimed.